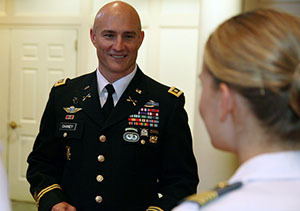 On September 10, 2007, then-Captain Chaney was serving as detachment commander for Special Forces Operational Detachment 083 of the 10th Special Forces Group (Airborne) during Operation Iraqi Freedom. He had been in country since May of that year, and since March the team he took over had been conducting missions on high-value Islamic State of Iraq (ISI, an arm of al-Qaeda at the time) targets. “In most cases, our element of surprise was exceptionally good, catching most targets in bed,” Chaney told an interviewer, noting that his “pretty senior team” had conducted more than 50 such missions before the night of September 10. Chaney and the two Green Berets maneuvered quickly to the primary target building, engaging targets as they moved. Using a grenade as cover, they burst through the door. In the fire fight that ensued, they killed the high-value target, but they also got shot. Then, an enemy grenade or suicide vest detonated, blowing Chaney and a fellow Green Beret five meters outside the building. Unable to move his legs, Chaney dragged himself to a dead ISI insurgent for cover. With a gunshot to his hip and with a broken tail bone and a concussion from the blast, Chaney was still able to take down an insurgent who was firing at him from another building’s open doorway. Then, noticing that a member of his team was bleeding from the stomach (gunshot) and neck (shrapnel), he threw an IR chem-light behind him to signal to the team’s medic, who was sprinting in full kit across 500 meters of plowed field along with the rest of the detachment from the second Black Hawk. Chaney’s second team member emerged from the target building with a wound in his stomach and “his left thumb held on only by his glove,” and the two of them engaged and killed more attackers. After 15 minutes of intimate fighting, the compound was secured. Chaney and his team were creditied with killing 11 ISI fighters, including the high-value target. An estimated 18 fighters were on the objective that night. They also rescued two Iraqi kidnap victims. For his gallantry and leadership in action against the enemy that night, Chaney was awarded a Silver Star and the Purple Heart for his wounds received in combat. Presented by the West Point Association of Graduates (WPAOG) and endowed by E. Douglas Kenna ’45 and his wife Jean, the Nininger Award is named for Second Lieutenant Alexander R. Nininger ’41, who fought the enemy to his death during the Battle of Bataan in January 1942 and posthumously received World War II’s first Medal of Honor. In addition to recognizing the recipient for his or her bravery as an individual, WPAOG regards the recipient as a given year’s representative for all West Point-commissioned officers who have heroically led soldiers in combat.